A Better Calgary President James Maxim was busy the past few months working with the Calgary Leadership Forum following the many announcements made by the Prentice government and the direction the upcoming by-election in four Calgary constituencies would take. Maxim was instrumental in organizing the Calgary-Elbow by-election debate, Alison Redford’s former constituency. Since Redford was exposed for a number of scandals involving misuse of taxpayer money earlier this year, Calgary-Elbow has been left leaderless. Maxim wanted the debate to demonstrate to residents of Calgary-Elbow what knowledge the candidates had on important issues within the Calgary-Elbow community. As a community that was affected by the 2013 flood, the issue of flood mitigation was a top priority, as well as education, health care and quality of life. All candidates started off the evening of Oct 7, 2014 with a five-minute introduction. · Gordon Dirks (candidate for the Progressive Conservatives) started off by outlining five items that were important to him: public education, strengthening communities, fiscal responsibility, revisions to the accountability act, and increasing market access of Alberta’s natural resources. · Greg Clark (candidate for The Alberta Party) focused on the “can-do” attitude of Albertans, how Albertans are known for helping each other and that politics is about public service. Clark further outlined how Alberta is a place of innovation and entrepreneurship and that he would be committed to advancing education, health care for seniors and advocating for flood mitigation. · John Fletcher (candidate for the Wildrose Party) told the crowd that he has 25 years of service in Alberta with the army and knowledge in the field of oil and gas and corporate securities. Fletcher was adamant about ending the entitlement that has been demonstrated by 40+ years of PC governance and that accountability could be restored in Alberta by strengthening the opposition party of Alberta. · Stephanie McLean (candidate for the New Democrat Party) conveyed to the audience that she was frustrated with the crumbling legal aid, justice, health care, social welfare, and education systems. She said, ‘She has yet to experience the Alberta advantage’ under the governance of the PC party. · Susan Wright (candidate for the Liberal Party), like Fletcher, highlighted her experience in the oil and gas industry, she further outlined her disappointment with Alberta’s high school drop out rate and outlined the need for a better education system that focuses on special needs and dialogue between educators and administrators. Wright also touched on advocating for a provincial flood insurance program and championed that she would bring back a high level of transparency and accountability to her constituents, if elected. The first question Maxim organized to have the candidates address was asked by a representative of the Calgary River Communities Action Group (CRCAG) on upstream mitigation and policy creation for flood hazard areas. Fletcher addressed the issue by stating that no project should be off the table and that projects may have to work in tandem. Dirks conveyed that there is a great need for urgency and that the Springbank diversion would be a quick solution for flood volume management. McLean stated that more studies needed to be done before a project was decided on and policy created. Wright agreed with McLean, and further stated that, “the flood brought us together, whereas the Prentice solution will tear us apart” (in reference to the Springbank diversion). Wright further voiced her concern about the lack of public consultation with residents in the Springbank area and the City of Calgary municipal government regarding upstream flood mitigation projects. Clark highlighted his six point plan for flood prevention that is on his website and championed the Tunnel as a viable option to start before the Springbank diversion and/or McLean dry dam. The second debate question focused on why the candidates were running for the position and what their views were on important current events. All candidates focused on the state of health care and education as their main discussion points. McLean, Wright, Clark and Fletcher further spoke to the need for transparency and the corruption seen by 40+ years of PC governance. Clark further expanded on his views on the need for accurate flood hazard mapping and recovering taxpayer money from the flood buyout program, as well as issues involving marriage equality and gay-straight alliances. The final question of the debate centered on the issues of public policy, governance, and quality of life. McLean reiterated her frustration with the legal aid, justice and health care systems. Wright outlined three points she would address if elected: rebuilding transparency in Alberta, rebuilding respect across all levels of ministry from top to bottom, and rebuilding respect for the environment. Clark outlined the importance of enforcing environmental regulations, reducing carbon emissions, getting Alberta off the ‘resource rollercoaster’, and putting funding towards arts and culture to promote quality of life in Alberta. Fletcher outlined how long-term care for seniors is failing in Alberta and the need for anti-bullying legislation. Dirks agreed with the other candidates and added flood mitigation and the need to built more schools and long-term care facilities in Alberta to his answer. Candidate then took questions from the audience, which addressed many of the issues touched upon in response to the three questions summarized above. It is in A Better Calgary’s view that Clark and Wright stood out in the debate. The two appeared to be well-prepared, were able to draw from the knowledge that they had versus reliance on scripted notes, and both made the effort to address all aspects of questions posed to the candidates thoroughly and succinctly. A Better Calgary thanks all the candidates for participating in the by-election debate and all the residents who came out to listen and ask questions. Southern Alberta is expecting heavy rain over the next 24 hours.Photograph by: Ted Rhodes , Calgary HeraldEnvironment Canada issued a flood watch advisory around noon Monday for the flood-prone community of Wallaceville in High River, as well as along the Crowsnest River and Willow Creek. A low-pressure system in the Northern U.S. is expected to bring significant rainfall to southern Alberta, with heavy rain expected for Kananaskis, Canmore, Exshaw and Ghost Lake areas, according to Environment Canada. 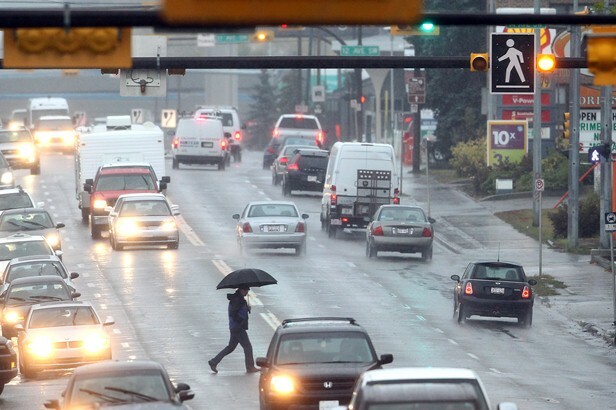 Calgary could see five to 10 mm of rain, with possible thunderstorms, through to Wednesday. Rainfall warnings were also issued for the Bow and Elbow Rivers, with the latter expected to receive 30 mm of rain on Monday, and 15 mm on Tuesday. Forecasters are predicting 50 to 70 mm of rain for the Bow River basin and 100 to 125 mm between the Oldman River basin and Cypress Hills. Foothill and mountain areas upstream of the vulnerable community of High River received up to 20 mm of rain over the weekend, enough to saturate the ground and produce a rapid runoff. As a result, the Highwood River and its tributaries, already swollen by spring melt, rose another 10 cm on Saturday. With the prospect of intense rain of up to 70 mm tonight, forecasters are worried the river may flood low-lying areas in the southern Alberta town. Forecasters said Monday that the Highwood River could reach flood thresholds at Wallaceville, which sits along the river near Centre Street, based on current rainfall scenarios. No other area of High River is expected to see flooding. After last year’s deluge, the town offered buyout packages for Wallaceville residents and intend to return the riverside area a natural state. To date, 65 of 107 homeowners in Wallaceville that qualify have accepted buyout offers, according to Alberta Infrastructure. The city of Calgary also issued an advisory Monday, saying rains are expected to increase flow rates into the Glenmore Reservior between 120 and 170 cubic metres per second (cm/s) by noon Tuesday. The Elbow River typically flows into the reservoir at 30 cm/s at this time of year. During last year’s flood, the river peaked at 1,200 cm/s. 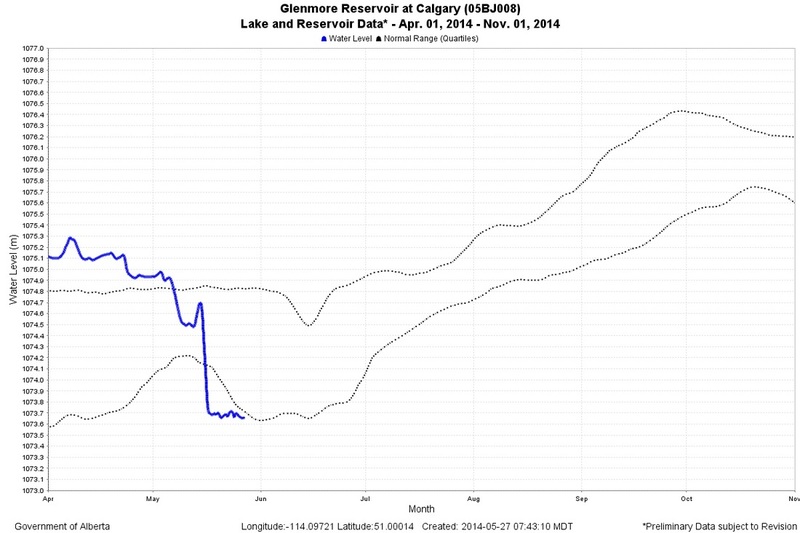 Calgary’s water services department has begun lowering water levels in the Glenmore Reservior in anticipation of the incoming water. 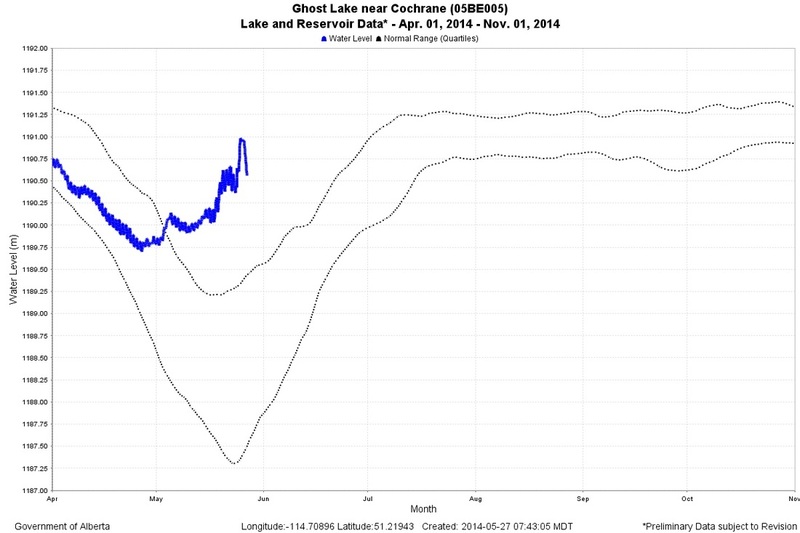 As a result, flow rates in the Elbow River could increase to 80 cm/s, still well below last year’s peak of 700 cm/s. “We are not particularly concerned, but we have to be prudent,” said mayor Naheed Nenshi. Nenshi said higher water levels may cause pooling on low-lying paths along the Elbow River, and the fire department will likely issue a boating advisory. With files from Matt McClure and Jason Markusoff. Many thanks to all of our members who made it to the AGM last night. We have attached our business and the presentations of Emma May, Tony Morris and Brenda Leeds Binder for those who could not attend. We are grateful that the Mayor and the Premier were able to join and we will continue our advocacy efforts. A powerpoint presentation prepared by Brad Geddes on DRP will also be uploaded to our website. Thanks very much to Brad for his compassion and honesty last night. I thought I would get started today by talking about something that none of us wants to hear but that we need to collectively understand. While the floods of last year resulted in a major natural disaster that no city in Canada has ever seen before, the flows of 2013 do not represent the worst ever recorded in the area. In fact, 1897 and in 1879 flows were recorded that were 30per cent higher. So as bad as last year was, the true risk that exists here is that the entire downtown business district of the economic engine of western Canada could be submerged under water and thus out of business for several months. Elevators would be shut down in towers for months on end. Economic losses would be exponential of what happened in 2013. This is not simply a homeowners issue. What we are here to talk about today is of critical importance to every Calgarian and every Albertan. Welcome everyone. Many thanks for joining us this evening. We would also like to extend a huge welcome our distinguished guests Premier Hancock and Mayor Nenshi, welcome to our MLA’s and City Councillors and a very warm welcome to our membership. On July 23 of last year over 500 of you answered our call to come together for a meeting to seek answers from Government Officials about what was going to be done to make sure that this type of catastrophe could be avoided in the future. It was a hot night in a packed room and there was a great deal of frustration, anger and fear in the air. We needed answers and we weren’t really getting any. In fact, we were unceremoniously told by some so called experts, experts that I painfully admit to asking to speak that night, that actually nothing could be done. Our days of sipping Mint Julpes watching the river go by were sadly over, he said. Allan Markin, Richard Lindseth and Tino Dimano had just been appointed to the Premiers’ Flood Advisory Taskforce. Allan passionately promised to report back within a few months. Promises he kept. He also gave us great advice that night. Advice that we have steadfastly stuck to. “Stay intelligently angry”. We seek upstream solutions that will protect vulnerable communities from devastating flooding. We seek the restoration of property loss and values. We seek to retain community integrity. We have always maintained that our role was to seek solutions. This was a disaster. It was clear that plans and policies were being rolled out and that we needed to engage with those who were making these decisions in a thoughtful and constructive manner. It is my belief that your Board has done this and that we have achieved a series of policy changes that will not only benefit flood victims but all Calgarians and Albertans. That didn't have to rebuild your basement as though it was a giant, expensive shower stall. Not every house in the flood hazard area will have a notation on land titles. While we certainly didn’t fix DRP problems, we did get your concerns to the right people and some changes resulted, the addition of a dozen Executive Directors to the DRP file and the non-renewal of LandLink contract and we have been advised now a complete breakdown and review of the entire DRP system is underway. The property tax credit was implemented by the City of Calgary. Land Use By-laws were amended in a way that is not unduly punitive to flood hazaard area homeowners. And Last but my no means least, the Province has committed to millions in mitigation projects. Including large scale projects that desperately need to go get fully green lit. But we all know that our work here is by no means complete. We still do not have in place the key mitigation infrastructure, losses are still mounting for many and community integrity is being tested. This Board is committed to fulfilling the mandate we set out nearly a year ago. I would like to take a few Minutes to introduce our Board and Co-Founders. This operation in an incredible exercise in team work, collaboration and cooperation. In the very beginning there was Greg Clark, Tony Morris and myself. Greg has a much keener interest in politics than I and he moved on to become the leader of the Alberta Party. Greg’s passion for his community was key to that first meeting and to the creation of this organization. Dr. Mike Bregazzi, Wade Felesky and Helen Wesley were all founding members of CRCAG and we are grateful for their contributions. Our Current Board and Steering Committee. Tony Morris. Tony has been at this with me since before our first meeting last year. Tony has a very soft voice. And I have learned that the quieter he gets means that I should really shut up and listen to what he is saying. It is typically insightful policy analysis. Brenda Leeds Binder. Brenda was a remarkable addition to our Board. She embodies the saying “when you want something done, give it to a busy woman to do”. Engineer, patent lawyer, mom to three and tireless volunteer. But most importantly her intellect cuts like a knife. Rob Neiuwesteeg is our resident Bownessian. His powerful presence and passionate drive to do what he can to help his community through this disaster is so welcome. Rob calls it as he see it. Anna Mvrack is our Treasurer and makes sure we don’t blow through your generous donations. (You can all take it up with her as to why my push to allocate some funds to Mint Juleps this evening wasn’t approved). Daryl Rudichuk stepped up and offered to dig into heavy lifting when it came to DRP and insurance matters. Gloria Mak and Steve Forrest are our most recent additions to our Board. Both are incredibly dedicated and organized. I know we can rely on both of them to dig through email chains and piece together cohesive research. I am so very grateful and humbled to be able to work with each and every one of you. The best way to build a great team is to make sure it is full of people way smarter than yourself. Mission Accomplished. Where Have We Been and Where Do we Have to Go. In early days we had meetings with with government officials wherein we expressed our confusion over policies that would force homeowners to spend vast sums of money supposedly “waterproofing” basements. Our first meeting on this topic was with the incredible Andre Corbould who was the head of the Flood Recovery Task Force. Mr. Corbould became a critical contact for us in government. And while we certainly didn’t agree on everything we could also be assured that Mr. Corbould was open to dialogue and to finding solutions that we could all agree on. Our conversations and advocacy lead to a shift in the DRP restoration standata and made individual mitigation requirements infinitely more practical for both the homeowner and the taxpayers. We have always given the Government of Alberta powerful feedback on the problems that we were seeing with DRP. How early promises were no where near the standards the DRP website offered to people, and that the website numbers in no way seemed to relate to the actual reality of when and how people would receive this much needed assistance. We have heard from you repeatedly - The system is clearly broken. Early meetings that CRCAG had with the government on the topic of DRP left us stymied and confused. We presented the findings of our surveys and established what we believed needed to happen in order to streamline the DRP process. The government of Alberta has now seized the file from Landlink the outside contractor charged with the DRP and despite changes such as adopting the caseworker model DRP remains largely broken to this day. Our suggestions such as having qualified recipients sign affidavits as to the amount of damage they had on a per square footage basis and how much insurance they received in order to speed up, clarify and add transparency to the process have not gained traction. We also remain disappointed that the Government of Alberta continues to manage the file in a way that is based on its fear of not be reimbursed by the Federal Government as opposed to assuming a some risk in order to help flood victims get back to being productive Albertans. To those who still have DRP files open, we continue to stress to you to aggressively advocate for yourself and continue the appeal process. DRP is a work in progress. Even if your file has been closed I believe that there is still room for improvement. While we have never been able to advocate for individual recipients we hope that our work has made you feel less alone in this long lonely journey and has inspired you to keep pushing for fair and equitable treatment. We know that no one here wants government handouts, but in the face of a such a disaster many hardworking taxpayers feel that after years of contributing to the system it is only fair to be asked to be treated with compassion and respect in such a time of need. We are very pleased to have Brad Geddes here tonight to explain to us a new direction for DRP. From the first we heard of the Floodway buyout policy we were terribly opposed to it’s application in urban Calgary. We felt that to offer buyouts, instead of to aggressively pursue mitigation options as was the policy direction in Ft Mac and Drumheller was akin to destroying communities. We were unsuccessful in our attempts to shift policy on this matter and we now see the impacts of this playing out as we predicted. There are checkboarded streets in our communities. What troubles me the most is the discrepancy that the policy creates between homeowners who suffered equally from the flood. For those whose homes lie in the floodway - they are entitled to receive a payment equal to 2012 assessed value of their home. For those who are not in the floodway, they are reliant on the pittance that DRP meats out. The Roxboro 14 as we call them, worked hard to make changes happen to the buyout policy. Troy Moller spent countless hours on the file. Sometimes despite great efforts we are unable to achieve great results. The impact on those left behind by the floodway buyout policy are empty lots, shuttered homes and - in some cases friendships severed. We hope to be able to work with the Province and the City to ensure that the community and neighbors guide how these lots will be reintegrated into the community. On the Municipal front, the City of Calgary truly rose to the occasion in the days and weeks after the flood. But as things seemed to go back to normal for most in the City, those in the Flood Hazard Area were still in the process of rebuilding. We were disappointed that the tax credit program the Province was offering was not rolled out sooner by the City and that Council seemed unaware of its very existence. The City of Calgary and CRCAG held several meetings around how to make sure that all the different business units that were engaged in flood recovery efforts would continue to communicate through a centralized process. As of late, we were able to work closely with the Mayor and City Councillors to ensure that Land Use Bylaw Amendments were not unnecessarily punitive to homeowners. I would like to thank Paul Battistella, a member of the Calgary Planning Commission, for all of his great advocacy in this regard. Paul was instrumental in assisting the CRCAG board in understanding the finer points of the By-Law amendments and his presentation at council clarified for many councillors the nature our organization’s concerns. To our members I say your emails to your councillors and your active engagement in this file made such an incredible difference. A heartfelt thank you to everyone who presented to Council on Monday. We are very pleased that clarity and certainty now forms part of the By-Law itself. Ultimately though, it has always been my personal belief that with effective upstream mitigation all of the aforementioned issues disappear. The team at CRCAG has always kept our eyes sternly focused on what matters most here. And that is that we do everything we can do to make sure the urban centre of Calgary and surrounding communities do not suffer from catastrophic flooding again. The emotional, physical and economic consequences are far too severe. And let us not forget those who perished in the flood. Calgary was founded at the confluence of the Bow and the Elbow River. Like many of the greatest cities in the world we live by the water. Unlike many of those same cities, we are only just coming to understand the risk that is associated with where we built our downtown core. And so now we to need to take steps to appropriately address that risk. And it isn’t to move downtown and historic communities. And I mentioned earlier, as bad at is was this year, the true risk that exists here is the submersion and subsequent shut down of the entire downtown core - not for days - but for months. This should be a matter of grave concern for all Calgarians, whether they happen to live in low lying areas or not. None of us is immune from the negative impacts of a flood. The whole cities economy would be impacted, work places shut down, companies and employees deciding that Calgary is not a safe place to do business, increased insurance premiums etc.. This is not just a homeowner issue. It was a wake up call for every Calgarian. But today I am happy to report that, unlike a year ago, all indications are that every level of government understands this and action is being taken to protect the heart of the new west. Andre Corbould was the Associate Deputy Minister in change of the mitigation portfolio until the April 29th Symposium where large scale mitigation projects were announced. Mr. Corbould spent the past year exploring all the options on the table before us. His team scoured plans and options, located expert engineers in water management and lead to recommending major projects for the Bow and the Highwood. CRCAG was made a member of the Water Collaborative, a stakeholder group that followed the progress of the Mitigation plans. The Province recently announced an agreement with Transalta that would stem flows on the Bow River by 100 cms. We certainly think that more needs to be done on the Bow, either through further operational changes of existing facilities or by way of additional storage and we will continue to advocate for these infrastructure and seek explanation as to why larger scale projects for the Bow do not currently form part of the Provinces mitigation plan. Nonetheless the Transalta deal is a welcome announcement in the middle of flood season. On the Elbow River, we require large scale additional storage. Today we saw the City of Calgary release a report confirming the feasibility of the tunnel. We are pleased to see that the Tunnel can now be added to the list of projects to mitigate on the Elbow. I am comforted to know that engineers have found ways to increase the storage capacity of the Springbank Road Diversion and that the Province is driving ahead with Land Acquisition, planning, and detailed build design. Between the tunnel, the diversion and the dam at McLean Creek we should see communities along the Elbow and the core offered full protection from flows such as the ones we had last year. The province has allocated money in the budget for these projects. But there are hurdles before us. We will continue to ask how the City and Province plan to sort out the funding of the Tunnel. We will continue to seek up to date reporting on the progress of these projects. There are also Environmental Impact Studies that need to be completed. But it is my personal belief that adjudicators will most definitely find that these projects meet the test for falling within the public interest. I would be remiss not to mention at this point in time the incredible dedication of Mr. Allan Markin to this cause. While you all may have read about the wall around his house what you didn’t know is that Allan is and has been the most passionate advocate for getting these projects built and built quickly. Not a week goes by where Allan isn’t following up on engineering or checking in with ADM’s and DM’s to monitor progress. I do not believe that we would be as far down the road as we are without Allan’s relentless drive. While his formal role on the Flood Advisory Panel was disbanded so the province could drive the work forward his commitment to his community is ongoing. Thank you Allan for all you do. So many of you have been part of this huge endeavor. Steve Allan and Dave Allan, thank you for your work on behalf of fellow DRP recipients. Shannon Larkins and Jo Williams and Menno Vanderlist thank you for your web contributions. John Conrad for his compassion in dealing with DRP files. On a personal note, I want to say that it has been an honor to serve my community in this way. I really haven’t done anything like this before. I do hope that you feel I have been up to the challenge and have effectively advocated on your behalf. So many of you have shared deeply personal stories with me and I honor your trust and thank you for your honesty. As I mentioned at the outset there is still much work to be done. We need to stick together and continue our advocacy so as to make sure that the political will to get these major works done stay alive. We need to support each other through ongoing recovery efforts and educate others as to why this is not simply a homeowners issue. Thank you for your ongoing engagement and support. I have the distinct pleasure this evening of introducing someone who clearly needs no introduction in this City – His Worship Mayor Naheed Nenshi. “The most enduring image of the flood … is that of the ordinary citizen – covered head to toe with mud and mosquito bites, cut and scraped and bruised – working hard to save the home of someone she doesn’t even know. Every one of us figured out how to use our hands, hearts and minds to help our neighbours. Why? Because it’s what we do. I’m knocked to my knees every time I think about that sign in Bowness put up by a family that had its home completely gutted. “We lost some stuff; we gained a community.” This story repeats, hundreds and thousands of times, across the city and the province. I once asked a volunteer if she was affected by the flood. Isn’t that the truth! As Emma as already pointed out – a major flood in Calgary affects everyone – whether it’s their home, their workplace, the parks and pathways they enjoy, events at the Saddledome that were canceled, the closure of the zoo – we were all affected by the flood. Mayor Nenshi showed commendable leadership last summer – managing the emergency response during the flood; and then rallying spirits and motivating volunteers during the clean-up. As we move from the recovery phase onto the prevention phase – strong leadership is critical. Duff’s Ditch in Winnipeg is an excellent and relevant example. The Red River Floodway, built in the 1960’s to protect Winnipeg from flooding by then Premier Duff Roblin, was initially received with skepticism. It took a courageous leader to rise above the criticism and do the right thing. Premier Roblin is now hailed as a visionary. Duff’s Ditch has saved Winnipeg from massive flooding more than 20 times and paid for itself in saved damage costs many times over. In Calgary, we are fortunate to have a strong leader in Mayor Nenshi, and we look to his leadership to set the course for flood prevention in Calgary, working with leadership in our provincial government. We understand a report on the proposed Glenmore Bypass was released to City Council today - a tunnel that would divert water from the Glenmore reservoir directly into the Bow River, rather than having it first flow through our communities (and basements) and downtown core before the Elbow merges with the Bow east of downtown. We’re excited that the report indicated the bypass is feasible! We wait with eager anticipation to see the next steps of our leadership in keeping the flood waters out of our city. So – no pressure Mayor Nenshi – but a “Duff’s Ditch” for Calgary – we’ll call it the “Nenshi Network” – would be much appreciated! Your Worship Mayor Nenshi, I turn over the floor to you. Brad Geddes presented on Behalf of DRP. A link to his presentation will be provided on our website. Not to put too fine a point on it, but this has been a hell of a year. Each one of us and our families has faced huge and unanticipated challenges. I think it's fair to say we're all exhausted and too many of us are dealing with personal tragedy and huge financial setbacks. This has been a major event in all our lives. As a community, we're slowly rebuilding our homes, our neighbourhoods and this City. As new issues and challenges have arisen, we've found the capacity to respond. As Emma said, there's still much more to do. And the Action Group's work will continue until shovels are in the soil and so long as there are threats to our communities, both natural and man-made. The Action Group extends its sincere thanks to Premier Hancock, Mayor Nenshi and Mr.
Geddes for speaking with us this evening. Given the stress the flood has produced this past year, there was a certain bravery in doing so, and that's recognized and very much appreciated. By extension, we also wish to thank all of the elected officials and government administrators who've made huge efforts toward recovery and the critical upstream mitigation work that must happen to protect this City. It's monumental, and monumentally important, work. The Group knows its far easier to pick up and throw stones than to lay them as the foundation to the best outcomes, and we thank everyone who's helped build that foundation and who's listened to our input. I'd like to personally thank each of my colleagues on the Board for having stepped up to the tremendous effort you've made these past many months. Your energy, intellect, good humour and absolute resolve have kept us churning along. That and the Zinfandel Emma brings to our meetings. Thanks also to our respective spouses and families for putting up with all of this. asked for a survey to be completed or issued a Call to Action, you've responded. It really has made all the difference. Lastly, there are really just two reasons we're here tonight. One is of course the calamity in the early morning of lastJune 21. And the other is Emma May. Emma has been fully engaged in this odyssey since mid-July, and I mean fully engaged. She has arranged and attended more meetings, made more phone calls, answered more distressed emails, written more communiqués, posted more information, bent more ears and twisted more arms, than anyone could possibly imagine or expect of any volunteer. All this while managing a family and starting a new business. She's absolutely determined and resolute, she's kept her wits about her and she's been able to keep productive conversations continuing with very many people who would really rather not have us in the room. I believe that each person in this meeting and, I think without exaggeration, this City, has benefited from her tenacity and approach and I think we all owe her a huge debt of gratitude. So on behalf of the rest of the Board and I'm sure the entire Membership, thank you Emma. Hopefully, by this time next year at our second AGM, we will be speaking about the tremendous progress of the construction on all the necessary upstream mitigation projects and we'll be able to report on the development of thoughtful, constructive, helpful policy. In the interim, we ask for your continued support and feedback. Please continue to do whatever you think appropriate to look after your homes and community. All voices are needed. Thank you so much. And I now ask a Member to move for the adjournment of this Annual General Meeting. CRCAG is happy to report that today City Council voted to include the sliding scale mitigation guidelines into the Land Use Bylaw Amendments thereby creating clarity around development in the flood hazard area. CRCAG would like to the thank Paul Battistella for his excellent guidance and advocacy on this issue. We would also like to thank all who wrote to council and came to council today to speak on this important matter. Your continued engagement is necessary and needed. I wish to share with you the Rideau Roxboro Community Association Newsletter and draw you attention to the letter addressed to the Mayor and City Council as to our Community recommendations on the proposed new City of Calgary By-laws for the flood affected areas of Calgary. Our annual summer party is scheduled for Saturday, June 21 beginning at 4 pm on Roxboro Glen Road (by the dog park and Marion Gibson Hall). Flood volunteers, family, friends and, of course, all community residents are welcome to attend. It promises to be the largest and best event we have ever put on, though we would like to have a general idea of likely numbers so we can ensure it is well run. Lavina Gilliland along with a number of other volunteers have put a tremendous amount of work into organization. Watch for further notices. The City Bylaw Amendment discussed in the last newsletter is coming back before Council next Monday June 9 at 9:30 am. Some amendments have been made, though it still designates the neighbourhood as non-conforming. See below for more information and send a letter or plan to attend if you have strong views. Unless something significant happens, this will be the last newsletter until next September. It has been quite a year. Enjoy your summer! Bands, food, tents, activities for children, a cash bar, volunteer recognition items and general laughter and conversation will be the order of the day for the party planned on Saturday, June 21. Volunteers will be needed and let Lavina Gilliland know if you can help. All those that helped out during the flood are invited to this event, though we decided to not put out a general invitation to the world because we cannot safely manage a Woodstock with our limited volunteer pool. If you have people you want to invite, please do so but please make sure you let the organizers know, especially if you expect a large number. We hope to have a great turnout. After several months of work, the restoration of Marion Gibson Hall is completed. The community association executive is in the process of replacing chairs, tables and other items lost in the flood. We are also looking at changing the deck but we are back to functionality and we expect it to be open again by the time of the summer party. Fortunately, the building was insured and even the deductible was covered through a grant. Many thanks to those who worked on getting the building back and in particular, Jeff Belford. The essence of the report was that sand bagging low lying areas along the river is feasible. We do not believe the few private homes asked to participate would object. It could raise water levels in surrounding communities by as much as an inch. It would involve about $90,000 in sandbags and an unknown amount of labour. It would be much less costly if some landscaping was done on empty lots and the park by the embankment as probably 2/3 of the work would be building up the bank between 2nd avenue and the embankment. - a number of residents mentioned that fixing the problems with the sewer system and pumping station should be top priority as sewer back up was was the source of most of the problems in the 2005 flood and universal in the 2013 flood, though the overland flooding made it less visible. Community Association President Lee Prevost will take the report forward to public officials with a view to seeking their response, and in particular to the City with a view to getting something done on the sewer back up problem and the pumping station. We will keep you posted. Proposed Land Use Bylaw ChangesThe changes to the Land Use Bylaw affecting our community come back before City Council tomorrow. In response to public pressure, the City has proposed some guidelines for its discretion to require further mitigation steps if a development permit is sought. Please refer to the City website and the CRCAG website for more information (see May newsletter). As we understand it, under the proposed guidelines the required mitigation for an addition of 10%-50% are an electrical disconnect above the flood line and a backwater valve. Between 50%-75%, the additional requirement is protection for the mechanical equipment. Lee Prevost specifically asked if raising the furnace and hot water tank off of the basement slab would qualify as adequate protection and both Mark and Carol (Administration) said yes. Using a footprint of 1000 sq ft. as a basis, we didn't see any viable 10% addition that community members would choose to undertake, meaning we felt the 10% maximum addition without mitigation was a throw away. 20% at least allows for the addition of a front entry, vestibule, bedroom - reasonable spaces. The Community Association thinks that should be the minimum. For everything else up to 75%, the mitigation requirements on their own are not prohibitive (in fact most of our community has probably already satisfied two of the three), until you introduce the non-conforming label and make the sliding scale discretionary. So the Community Association position is in favour of incorporating the mitigating effects of the upstream projects into the discussion, removing the non-conforming label, and embedding the sliding scale into the bylaw. Below is a letter President Lee Prevost has sent to the Mayor and to the Councillors. Please consider sending a similar letter, or attending tomorrow's meeting, beginning at 9:30 at City Hall. We request that you reconsider the Proposed Land Use Bylaw Amendment for the Flood Hazard Area that is slated for the June 9th meeting of City Council. Although we were encouraged when Council tabled the amendment on May 12th and directed City Administration to engage with the public, we are disappointed that no meaningful subsequent engagement occurred. Instead, we were informed on May 29th that existing homes will still lose the grandfathering clause, will henceforth be considered non-conforming, and will require a relaxation in order to invoke the sliding scale mitigation requirements contained in the bylaw amendment. We would like the following factors taken into consideration. We are pleased to announce the attendance of our special guests The Premier of Alberta, the Honorable Dave Hancock and The Mayor of Calgary, His Worship Naheed Nenshi. While there is no need to RSVP, please do take the time to let us know if you can attend so we may have appropriate seating on hand. Last year, Lorenzo Alfieri and his team at the European Centre for Medium Range Weather Forecasts predicted that the City of Calgary would be inundated ten days before the June 2013 flood. This year, Alfieri and his team are now saying that the Bow River will crest again on June 21, 2014, the anniversary of the Alberta 2013 floods. It is imperative that the Government of Alberta and The City of Calgary continues to collaborate and communicate with international weather monitoring and forecasting systems to ensure the safety of all Albertans. Given the possibility of a 1:5 flood event on the horizon for the Bow River, and the possibility of lowland flooding and ground water seepage in Bow River communities, A Better Calgary expects that information and preparedness measures be posted on The City of Calgary flood preparedness website immediately. Residents of Bow River communities may breathe a sigh of relief knowing that the Government of Alberta and TransAlta have reached a one-year agreement that will keep the water level in the Ghost Reservoir at ~1189m until July 31. After this year's flood season, TransAlta and the Government of Alberta will evaluate the measures that were taken and determine if such flood mitigation efforts will be implemented again in the future. Although this important information for Bow River communities is missing from the City of Calgary flood preparedness website, A Better Calgary endeavours to post information that will ensure that all Calgarians that were impacted by the June 2013 flood are informed. Fifteen vital flood mitigation projects are completed or well underway in Canmore and neighboring communities within the MD of Bighorn. Kyle Fawcett, Minister of Jobs, Skills, Training and LabourThe projects, funded in part through the province’s community flood remediation programs, address the specific concerns and needs identified by municipalities. To date, over $200 million has been invested in communites across the province, including $28 million to Canmore and $11 million to the MD of Big Horn. Robin Campbell, Minister of Environment and Sustainable Resource DevelopmentThe mitigation projects already in place will strengthen flood protection for Canmore this summer with further protection offered as longer-term projects reach completion. “These projects are a great example of community, Municipal governments and the Provincial government all working together to achieve amazing results in an extremely short period of time. The spirit of cooperation is unprecedented and the completion of many of the projects in time for the spring run-off is a clear demonstration of that”. John Borrowman, Mayor of CanmoreIn addition to community mitigation, the Government of Alberta is also taking steps towards a number of larger structural flood mitigation projects including a Highwood Diversion, an off-stream storage site at Springbank, a dry dam at the confluence of McLean Creek and the Elbow River, and upgrades to a number of dams and other water management structures. Under the Building Alberta Plan, our government is investing in families and communities, living within our means, and opening new markets for Alberta's resources to ensure we're able to fund the services Albertans told us matter most to them. We will continue to deliver the responsible change Albertans voted for. James Maxim is the President of A Better Calgary.